After last week’s Night Owl Radio one-year birthday special, we take the celebration from the airwaves to Exchange LA for a party people will be talking about for a long while. 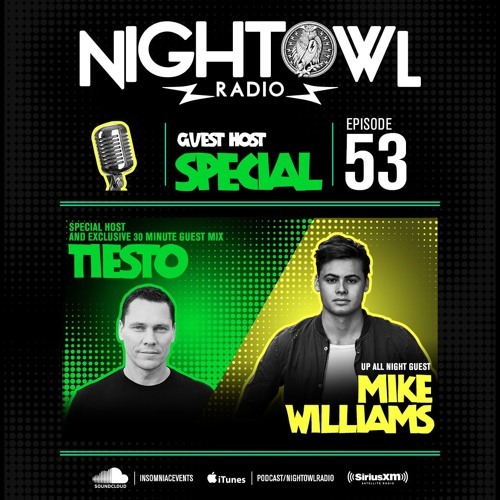 Since Tiësto is already swinging into town to DJ at the event, it made perfect sense for him to host this week’s show. Pasquale takes a short breather, but not before he passed along his list of dope tunes for the A-lister to work into the episode. Tiësto gets a say in the proceedings, however, programming a few of his own picks into the mix. He taps rising sensation Mike Williams (who has placed a few productions on Tiësto’s Musical Freedom imprint) to drop off his Up All Night selections. Together, they make a damn-good team. The last track is where it’s at, though, a classic record we will never get tired of hearing no matter how many years fly by.